Jargon Restaurant – Dinner, Dessert, Cocktails and More! Jargon Restaurant’s food menu can be described as New American, but we like to call it Continental Social Cuisine. We are inspired by an eclectic array of culinary styles and life experiences and use the best local ingredients to create each dish. 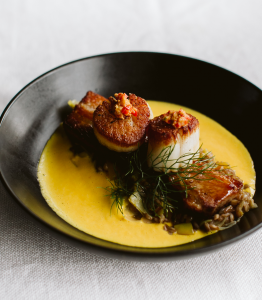 Our diverse menu is meant to be shared and savored by your whole table, creating a delightfully memorable dining experience in West Asheville, North Carolina. Menu subject to change regularly due to the availability of seasonal ingredients and the creative sensibilities of our chef. Try our signature Blunch cocktail: The Shrimp Cocktail Bloody Mary… Choose a traditional or spicy Bloody Mary, topped with a Jumbo Shrimp Cocktail!